What's up there, short stack? 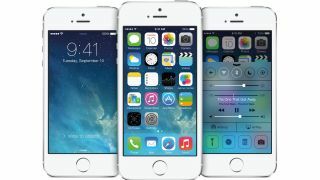 Despite the success of handsets 5-inches and larger, you felt it was with a certain amount of reluctance that Apple bumped up the iPhone from 3.5-inches to a dinky 4-inches with the iPhone 5. Now, according to reports emerging from China, the company is tossing out its display size inhibitions and plans to launch two much larger iPhone 6 handsets later this year. Chinese tech analyst (yes, we know and are sufficiently sceptical) Sun Changxu told the QQ.com website the smaller model will be 4.7-inches, with a 1136 x 640 resolution and will be unveiled at WWDC in June. If you thought an extra seven-tenths of an inch was a big deal, Changxu reckons the larger of the two will arrive later rocking a massive 5.7-inch higher resolution display, giving Apple a change to make a play in the phablet arena. A staggered release for two different screen sizes would be a definite break from the norm, as would a smartphone launch at WWDC, where Apple has traditionally focused on software. Of course, this is just one of a number of rumours circulating at the moment regarding the iPhone 6. As these analysts sure do like to make a name for themselves with their brazen predictions and claims of inside knowledge, we're taking this prediction with the necessary sprinkling of salt. Most of the rumours claim larger screens are on the way, but since September we've heard everything from 4.7- to 6-inches, so don't set your heart on that 5.7-inch screen just yet. Other recent tips have suggested a tougher liquidmetal display or a wraparound flexible screen, while the camera may focus on image stability rather than another megapixel bump.